There is a big gap between TV and social network in conventional Social Networking Services. The mobile terminals cannot get the interactive URL from TV broadcasting automatically and the social network cannot get the location information of TV customers at the same time. To bridge the two kind of media, the information of value-added services hiding in the real-time audio stream of TV programs is transmitted. 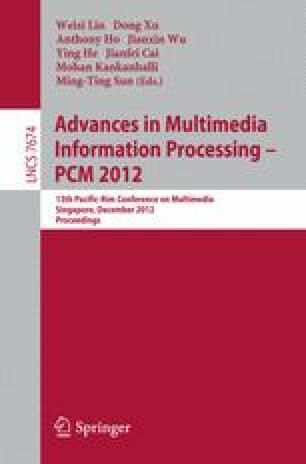 In this paper, the robust audio watermarking algorithm for social TV system is proposed, which analyze the character of background noise in the air channel, modify the energy coefficients of adjacent frequency bands in DCT domain of original audio carrier, and realize the recycling embedding of synchronization signal and watermarking information into original audio carrier. The experimental results indicate that, the proposed algorithm has a good hidden effect, and it is robust to air-channel background noise attack in transmitting process, AD/DA conversion, common signal processing, etc. In a conclusion, the proposed algorithm could put together TV and social network, which are separated before, and provide new idea for social TV system in its true sense. Supported by National Nature Science Foundation of China (61202470), Planning Project of Innovative Experiment of National Undergraduate (111048652, 1210486060), and Science and Technology Research of keystone Projects of Educational Commission of Hubei Province (D20123405).